Back Pain seems to be a pretty common issue. It isn't something that only elderly people have to deal with, but middle aged and even younger people suffer from back pain many times. This can be due to an injury, or maybe just a bad night's sleep. How many times do you wake up with an aching back, just because you rolled over in the middle of the night, and ended up sleeping in a bad position? I have to admit, I have done this a few times, but for the most part I am free from back pain. And it's something I am very thankful for, because I have seen exactly how painful an injured back can be, firsthand. Although I am not a doctor, and I would not presume to prescribe how to get rid of back pain, I have heard a few tips that sound like a great way to help at least alleviate back pain. One of the most common ways to relieve pain in the back is by an ice pack, or similar tool. If you're desperate, even something as simple as a bag of frozen veggies wrapped in a towel can help! Did you know that sleeping in certain positions can also help with back pain? It's true! Just as sleeping a certain way can cause back pain, so laying in a position can reduce back pain. A simple method to ensure you're preventing-not causing-back pain, is to sleep on your side with a pillow between your legs. This supports your upper leg, and greatly minimizes the chance for back pain or stress during sleep. One other way to relieve back pain is by incorporating some gentle stretching into your daily routine. It is important to make sure you're not pushing yourself too much, but some easy stretches in the morning can relieve pain in the back, and also get your muscles warmed up and ready to go, thus reducing chances of injury throughout your day. Have any more tips for relieving back pain? Feel free to share them here! Also note, I am not a doctor, and these tips are just my personal opinion; not a guaranteed method for getting rid of back pain! This is a sponsored post however, all the points and views are my own. I am thankful to say that no one in our family has ever received a ticket for speeding. My Dad always mentions that in over 30 years of driving, he has never been given a california speeding ticket, or any other speeding ticket. It's something our family is proud of, and we all strive to uphold the "family tradition" of staying in the speed limit and avoiding tickets. However, there is one funny story that we all enjoy sharing in occasion. In fact, almost any time our Dad mentions that he has never been pulled over for speeding, we are quick to remind him of the time he was almost ticketed for going too slow! About 8 or 9 years ago, our family was visiting friends in New York state. For some reason my Dad and I were driving somewhere; I don't recall what we were doing, just that it was only the 2 of us in the car, and we were headed back to the family's home where we were visiting. I think we had been getting some groceries, or possibly just getting a snack together (there's an amazing ice cream shop in New York that has really inexpensive double-dip cones!). Anyways, we were traveling through a school zone, so my Dad slowed to the posted 20 mph. The lights were flashing to show that school was in session, and so of course he followed the posted speed limit. About halfway through the school zone, a police officer pulled in behind us, with lights and siren on. My Dad pulled over to the shoulder, and awaited the officer's approach. When he walked up to the car, he informed my Dad that he had been driving too slow, and asked if everything was okay. When we explained that the lights had been flashing for the school zone speed limit, he laughed and said that school wasn't even going on that day. For some reason the lights were on, but apparently since we weren't from that area, we didn't know school was out for the week! The officer was very kind about it, but we still like to tease that our Dad almost got a ticket for driving 20 mph in a 45 zone! With the schedule we kept (or rather didn't keep, since there was absolutely no schedule or routine in our days whatsoever) on our trip to Florida, late nights and early mornings were pretty much the norm. I think there were at least 7-10 days straight that I only got about 5 hours sleep each night. Needless to say, finding good coffee was a necessity. Most hotels have coffee in the room or down in the lobby, but many times, this coffee just doesn't taste the same as a gourmet cup from a nice cafe. That's why I was so excited about the chance to visit Seattle's Best Coffee, located on campus at the University of Central Florida! After a long trip, that took longer due to traffic (if you've ever been in Orlando, you know what I'm talking about) I was more than ready for some coffee! It was a short walk from the drop-off zone over to the Seattle's Best Cafe, and I wasted no time in checking out the menu. 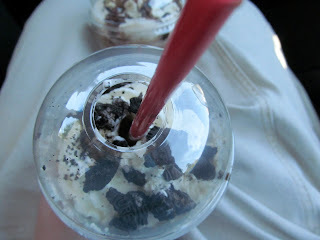 It didn't take long for me to spot exactly what I wanted to try-a Cookies and Cream Latte Frozen Coffee! 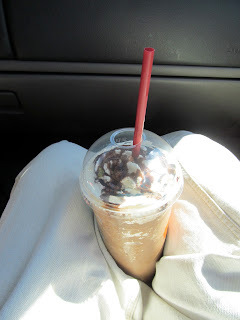 I ordered C a Mocha Frozen Coffee, since that is her favorite at just about any coffee shop. Both employees were very friendly and helpful, and made the experience extremely pleasant. It wasn't just a place-your-order-here's-your-drink-now-leave kind of thing, but they chatted about the weather, the traffic, and made me feel welcome at Seattle's Best. Jason, the manager, also came over and welcomed me to Seattle's Best, and told me a little about their business. 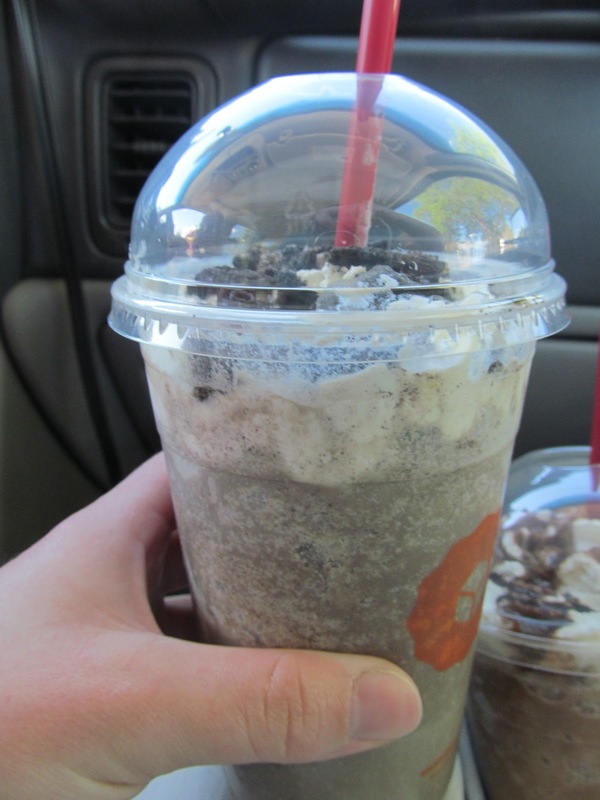 This was without a doubt, the best frozen coffee drink I have ever tasted! You may not think Oreos and coffee would taste good together, but they do! It was absolutely delicious, and I didn't need any help to polish off a large all by myself. (Okay, I gave C one sip just so she could see what she was missing). Speaking of C, she really enjoyed her Mocha Frozen Coffee, and said it was very tasty as well. I would certainly go to Seattle's Best again, and will be keeping an eye out for any cafes on our road trips in the future. I learned they also have locations in many airports, so if you're flying anywhere in the near future and need a cup of coffee, or a frozen coffee treat, I suggest you try them out! Tasting Kit and Coffee Mug!! Wow, am I ready to get home and take a vacation from...well, from our vacation! We were supposed to be back home by Saturday evening at the latest, but due to bad weather, and a few sick people, we decided to hole up in a hotel for a couple days before making the last leg of our journey. And, wouldn't you know it, I caught a head cold from the kids, so I have been in bed most of the day today. Headache, sore throat, and an overall achy feeling-I am sick and tired of being sick and tired! Anyways, that's what has been going on with us-other than the colds, everybody is doing great, and they're ready to get back home to a normal routine. Although I have to say, I think is the best vacation/road trip we have had in a long time! However, back to the issue at hand. Yep, you guessed it-more plumbing stories! They seem to be very popular here lately; always sharing stories and tips from http://www.rotorooter.com. So, while wracking my brain for any funny or embarrassing plumbing stories. I actually though of something the other day, that happened quite a few years ago when I was about 10 or 11. Our family was camping at a really nice, almost resort-style campground for a couple weeks. We were enjoying it, bike rides, playgrounds, plenty of fun for everybody. One day we heard some loud talking and yelling, so of course we all headed out to see what it was. Apparently one of the main water pipes had burst, and there was a literal geyser shooting out quite high into the air. Needless to say this provided great entertainment for us kids, although I'm sure it was quite a pain to get fixed. If I remember right, the Fire Department showed up to help close off the line, and I think it only took until the next day to get everything fixed, and water running back to the shower house. That was one camping trip we never forgot though, and we still talk about it occasionally! Are you looking for some productive home activities to engage in? As a mom, you most likely have to do a lot of things varying from keeping your home organized, caring for your family, and perhaps even working at your job as well. However, even though mothers get busy with their families and other chores doesn’t mean they can’t renovate a room in their home from time to time. Perhaps it’s time to take a break from all of your activities and revamp a room that you will adore. If you want to amp up the design of your home, first start with the walls. There are different types of paint, patterns, and wall paper that you can use on your walls. Also, let’s not forget about what goes on your walls after you’re done painting them, etc. Right now, indoor water walls are pretty trendy and if implement a new water wall in your room, the place will definitely feel calming and just like new. You can find a lot of diversity in the field of indoor water walls. Most mothers decide on placing water walls in their interiors and end up being so pleased with their selection that they find themselves gazing at the stunning water wall that’s in their stylish room. Once again, painting a room definitely helps transform a space. The color tones and shades that you decide on shows off your interior design personality and also revamps the interior. If you are designing your daughter’s room, for example, you should opt for shades of pinks or even orange and yellow. If you are designing your baby boy’s room, blue and even cream might seem the obvious choice. No doubt, you can play around with your color choices depending on what you deem appropriate. However, you should choose from the finest selections that will set tone for a perfect ambience in your room. Interior decoration is an important aspect too. The furniture that you have should complement the stuffs that you are buying. So, find out the different showpieces and antique products that are sure to look good and decorate and furnish your place elegantly. Most mothers may feel like after they have interior wall fountains in their interior that they may not have room for anything else since the fountain is so large. However, this could not be farther from the truth. Instead you should focus on either larger décor pieces that will blend well together in the space or have one main focal point surrounded by smaller decorative pieces. Whatever you come up with your interiors will look revamped and sophisticated – perfect for you to relax in after a long day at work too! Paige One enjoys writing about a variety of topics, from fashion to interior design! A few weeks ago I received a really great package in the mail; Revive Whitening sent me their Mild Strength Whitening System for review, and I was excited to try it out. Unfortunately I didn't get the chance to use the system before we left on our trip, so I brought it along hoping it wouldn't be too much of a hassle to use in a hotel room, especially with how busy I knew we were going to be! I did mold the mouthpieces before we left, just because I knew that would be a little hard in a hotel room, although probably not impossible. The molds can be stored and carried in a small plastic container that came in the kit, and then the syringes of whitening serum were very easy to just pop in my toiletry bag. I found the Revive Whitening System very easy to use, and really enjoyed how simple it was to apply and leave on for 20-25 minutes in the hotel room. Some days it worked best after breakfast as we prepared for our day, but other times I used it in the evening, while getting ready for bed after a long day out. 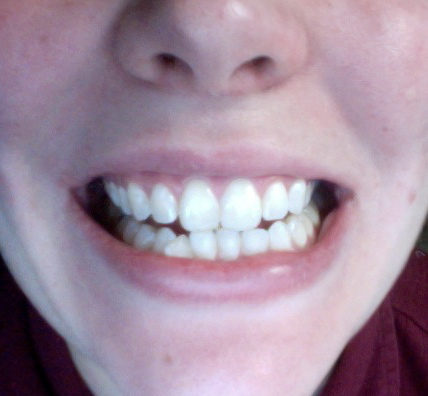 Either way, it was comfortable, and I was literally able to whiten my teeth while we were traveling! It's not some huge kit that requires a lot of room to work with the components, it's not too big to bring along on a trip, and it doesn't require a lot of effort. If you're wondering how the Revive Teeth Whitening System works, here are some before and after pictures for you. I recommend you check out the website soon; they are running some great introductory specials right now, but I guarantee these won't last long! Wow! I had a relative tell me several months ago that I needed to try out a sub shop called Jersey Mike's. For one reason or another, I never was able to visit one, but when I saw there were several locations near Sarasota/Bradenton, FL where we would be staying for several days on our trip, I decided to ask about a review. They graciously sent me 4 cards that are each good for a free regular sub. We ate at the Jersey Mike's in University Park/Bradenton. Upon our arrival, we all took a few minutes to peruse the menu, and decide on our choice of sub. Although my first choice is usually a steak-and-cheese style sub, I decided to try something different. So, I ordered the Famous Roast Beef and Provolone, with lettuce, pickles, mayo, salt, pepper and oil. I was amazed to see that at Jersey Mike's, they actually slice the meat when you order-you know you're getting fresh meats on your sandwich, and they aren't prepackaged junk. Just fresh, tasty meat! The rest of the family ordered as well; I think 1 chose the Original Italian, and 1 tried the Super Sub...but don't quote me on that! This is what was left of E's sub-just the crumbs! The subs are created right to your preference as you watch; as I said, the cheeses and meats are sliced once you order, and you can choose from white or wheat. Veggies and extra toppings are available, and of course the normal condiments. After paying for our drinks and chips, we found an empty table (much harder than it sounds; I have never seen a sub shop so busy!) and sat down to enjoy our meal. After unwrapping my Famous Roast Beef and Provolone, I was shocked at the size. While they consider it a "regular", to me it is more like a large! I was barely able to eat half of it! Jersey Mike's also serves some delicious sweet tea (for a girl raised in the South but now living in the midwest, that's a big deal!) to wash down your meal. Honestly, after finishing our meal at Jersey Mike's, I was thoroughly impressed-and hooked! I kept an eye out for more Jersey Mike's on our trip-actually just had one this past Tuesday for dinner! The prices are very reasonable; about $7.50 for a sub, that technically feeds both C and I. Add some chips and a drink, and you have a full meal for less than $10.00. The employees at both locations I've visited have been very polite and extremely efficient, and the restaurants are nice and clean. You just can't go wrong with Jersey Mike's Subs! One of my readers will win 2 Free Sub Cards!! 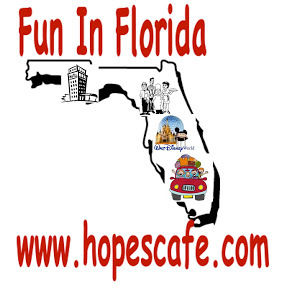 Wow, I have a new favorite place to visit when we're in Florida in the future! I am ashamed to admit, even though I spent quite a few years in Florida as a child/teenager, I never visited SeaWorld. So when C and I were given a media pass for our visit last week, I was excited and curious as to what it would be like. We arrived early on Tuesday morning, and after getting our tickets and a map, started out on our journey. The first stop was at Stingray Lagoon. To my amazement, we were actually able to touch (and feed) the stingrays. The pool is a little below waist-height, and the stingrays just swim around the circle. I was a little nervous, because after all, we're talking stingrays-they sting! However, I did touch one, and was surprised-they actually feel slimy, and almost like a soft, gooey rubber. Pretty neat! They kept slapping against the side of the pool, looking for food. We spent a while just watching the action. Next up, we passed Dolphin Cove. Again, we spent time just watching the dolphins, and laughing at their antics. Some of the employees were feeding them, and making the dolphins perform. Very neat to watch!! Later on, we also learned we could get close to the pool, and I was able to pet a dolphin as well. One of them stayed right in front of me and kept blowing water, then laying on the ledge of the pool. They are so friendly, and so gorgeous! This was probably THE highlight of my day at SeaWorld! As we followed the path around, we decided to visit Turtle Trek later in the afternoon, and continued on until reaching Journey To Atlantis. This is an exciting ride that is half flume, half roller coaster. It starts out with a ride through beautiful scenery, until you reach a point of no return. 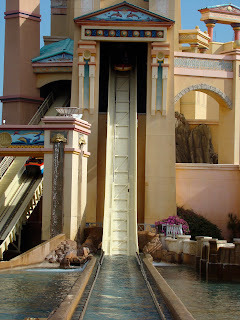 You're hauled up and promptly dropped down, like a typical flume-and it feels really good on a warm day in Florida! However, the ride doesn't end there. As you round the corner and think it's over, you are brought back up, and then flung down and around a corner, more like a roller coaster than a normal flume! Add to that the pitch black surrounding you, and you're in for a thrilling ride! Next up was Kraken-from what I have heard, one of the top-rated roller coasters in the world. C doesn't care for roller coasters, so I did this one alone. One of the unique aspects to Kraken, is that after getting seated and buckled in, the floor drops out from beneath your feet. You are left sitting, with legs dangling during the ride. It starts out with the normal uphill climb, but after that nothing about Kraken is normal! 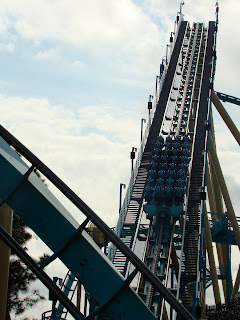 The first drop is not straight down like most coasters, but includes a sharp curve as well. From there it's a wild and thrilling ride as you are jerked around curves, dropped down into a tunnel, flung upside down multiple times, and of course, all the great drops that leave you gasping for breath. I have ridden many roller coasters at many different theme/amusement parks, and I have to say that Kraken is honestly the BEST roller coaster I've ever been on! 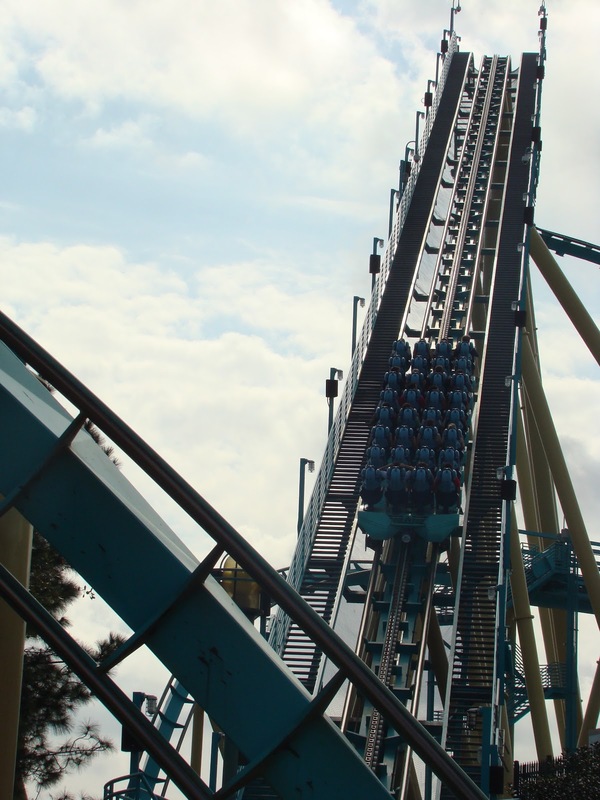 You have not experienced a roller coaster till you've been on Kraken! I rode 3 times in a row, and went back for more before leaving the park that evening. We made a detour to Captain Pete's Island Eats for lunch, where C and I shared a large nacho platter. These were delicious, and very filling for us. We also purchased one of the souvenir cups, which can be refilled for only 99 cents throughout the day. And, if you visit SeaWorld throughout the year, you can bring your cup along for more 99 cent refills! You can not beat that deal. If I shared all the highlights and events in our day, this post would be several chapters long. So, let me just share a couple other areas that you need to visit if you're ever at SeaWorld. First, the Wild Arctic Ride. C and I took the "helicopter ride" to the Arctic base camp, which is basically a simulator. You will experience a helicopter ride through the arctic, with many thrilling aspects-an avalanche, a winter storm, and even dropping down under the water to view the Beluga Whales! After your arrival at the base camp, you can walk through the "Wild Arctic" and see Beluga Whales, Polar Bears, and a Walrus up close. The Beluga Whales are absolutely gorgeous, and the Walrus is simply HUGE! On our way out, we stopped at the Turtle Trek. This is a 3-part journey that starts with a stop in the underwater manatee viewing room. You are introduced to SeaWorld's manatee, and then move into the next room, where you can see the Sea Turtles. Other fish also swim in this area; the Alligator Garfish were really neat! The last leg of your trek is at the 3D, 360 journey through a Sea Turtle's eyes. This was amazing, and so neat! We loved watching the Sea Turtle craw out of her shell, make the trek out to the water, and then avoid danger, see the beauty that abounds underwater, and then return to the site of her birth to lay her own eggs. The 3D effect combined with the 360-degree view, makes Turtle Trek a must-see for anyone visiting SeaWorld! One other thing I have to mention about our visit-I was very impressed by how quickly the lines moved, and how fast I was seated on the rides and attractions. Even in the middle of the afternoon, when lines are usually really long, for the big rides like Kraken and Journey to Atlantis, I only waited for about 5 minutes. Sooo much nicer than the parks where you have to wait for up to an hour or more for one ride on the roller coaster! I highly recommend SeaWorld for any family (or individual) visiting Florida. It's so much fun, and you will remember the trip for years to come! Finished off the day with a delicious funnel cake! Disclaimer: I was not monetarily compensated in any way for this review. I did receive complimentary tickets for my review. I was not required to post favorably about SeaWorld; all thoughts and opinions are mine.